“In recent years, the BRICS countries have achieved rapid economic growth and become an important force for addressing international financial crisis” Jiechi said in a welcome address ahead of the BRICS Summit in Durban. The BRICS countries had pledged to provide about $70 billion to the International Monetary Fund’s global firewall against Europe’s debt crisis, adding to the IMF’s lending fund of $380 billion, as they met at the G20 summit in Mexico in 2012. Jiechi said BRICS is driving world economic growth, improving global economic governance and promoting democracy in international relations. He also praised the vitality of the BRICS mechanism which he said, inspite of being young, has made great strides in world economy. The new growth drivers of the world will be from BRICS countries, according to a report by the United Nations Development Programme (UNDP). Jiechi noted that BRICS countries share identical or similar views and propositions in international affairs. China believes the BRICS cooperation meets the trend of the times and represents a progress in history, he said. Xi Jinping, China’s new president, will attend the Summit in one of his key foreign trips after being sworn in. “As the first BRICS Summit held in Africa, the Durban Summit carries important significance,” according to Jiechi. The African Union has been invited to attend the BRICS Summit in Durban as an observer. Rob Davies, South Africa’s minister of trade and industry, said last week that South Africa has a strategic interest in extending BRICS cooperation to support Africa’s development agenda. 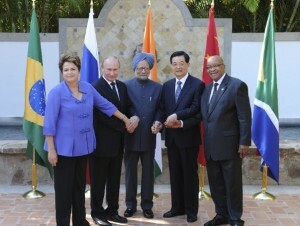 “There is no doubt that Africa’s relationship with BRICS has influenced growth in the continent,” asserted Davies. “China is a firm supporter of and constructive participant in BRICS cooperation, is convinced that the summit will help BRICS members further strengthen pragmatic cooperation in various fields, consolidate partnership.” Jiechi said.